“Funnels” are all the rage these days in the Internet Marketing space, and for good reason – they work! Though the term “funnel” is a newer word, sales funnels are not new at all. 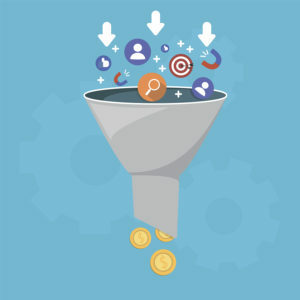 Basically, a funnel is a series of steps that a marketer puts into place in order to get the most money out of the lead. A smart marketer will not push garbage on them either. Good products that really help people always end up making you more money in the long run, so it’s really a win/win! With that being said, today I want to provide you with the “skeleton” of a funnel that is profitable, but not difficult to setup! There are many different ways to setup funnels. Some are more effective than others. There are various reasons to setup various types of funnels, but we’ve found this to be a very effective, simple funnel that is effective for a wide variety of applications. This funnel is effective in generating the two most important results in Internet Marketing: email subscribers and sales! Produce something of value that is free and give it away in exchange for their name and email. The more appealing this freebie is, the more profitable your funnel will be, so put some thought and time into this! Find a product you can solve, or a pain you can relieve. A short ebook or report, a simple script or piece of software, even a free video that reveals some sort of secret… these are all excellent choice, but it really could be anything that would entice people to opt-in! Send them an email series. Immediately after opting in you obviously want to deliver whatever it is your promised them.One day later check in on them with an autoresponder email… let them know you’re interested in their success. “Have you read the report?” Here are answers to some common questions people have at this point.” Things like this go a long way in starting to build trust, which is very important!Two days after that check in again with an auto-responder email. Make yourself available… “Just reply to this email if you have any questions.” But also provide some sort of new, free info in this email.Two days after that it’s time to sell! The more relevant your offer the more you’ll sell. If you gave away a free report (for example) titled, “How to Rank in Google in 30 Days” and you created a tool that helps them to rank in Google even quicker, or with less time or monetary investment, push it to them at a special discount! You can even push an affiliate product, but get with the product owner and work out a special discount offer. Special discounts and urgency (ie. 3 days only) are very important with any promo… they will seriously increase sales. One day later send another auto-responder email telling them that there is only X days left to take you up on the offer. Go into detail as to why they need it an what problems it will solve … and how great it will be when those problems are solved as a result of XYY product. One day later send a “LAST CHANCE” email on that offer letting them know it’s now or never! After that promo series is done you can add an unlimited number of promos. It’s always good to add some free content mailers between the promos, especially with fresh leads. Offer those who purchase a One Time Offer (OTO). Find another product that is very relevant to the product sold. It needs to be directly tied into the product sold. An irrelevant or somewhat relevant OTO will not convert. If the product requires credits, offering bonus credit at a steep discount is a great idea. If the product needs articles in order to be successful using it, offering something that will help them to produce articles… things like that. Again, put some thought into this… it’s important! Put the buyers through an Email Series! It goes without saying that you absolutely MUST collect the name and email of your buyers! They are your BEST leads. Most credible systems, like PayKickStart, do this for you (you just add your autoresponder details and select that option when adding your product).Put your buyers through a similar series as you do your free opt-ins, but you can generally be a little more “salesy” when buyers, since they’ve already shown a certain amount of trust in you buy purchasing your product. So, the funnel starts with a cold lead opting into a “squeeze page” which is basically just a simple page with a video and opt-in form, that focuses heavily on the opt-in. The funnel ends in the subscribers buying multiple products. To get people into the funnel promote the freebie offer at forums, get ahold of Internet Marketers with lists and give them some sort of incentive to blast it to their list. Run Facebook ads. Do everything you can to get eyeballs on that squeeze page! It’s MUCH easier to get people to opt-in in order to receive a freebie, than it is to get those cold leads to buy. It’s simple, but effective. Give it a shot and make more money online!